To all those in the blogging community who celebrate the holiday, Happy Hanukkah. Hanukkah (or Chanukah) is an eight-day celebration which commemorates the reclaiming of the Second Temple in Jerusalem during the second century by the Maccabees from the tyrannical monarch led by Antiochus IV Epiphanes. He was not quite as compassionate as his father when it came to the Jewish religion. His father permitted the faith to be practiced, but his son outlawed it, and when his soldiers came to Jerusalem, the murders of thousands occurred. The soldiers then moved to the Second Temple and further defiled it by setting up statues of Zeus and sacrificing pigs. Judah Maccabee and his small group rose up against Antiochus IV Epiphanes and was able to push them out of Jerusalem. 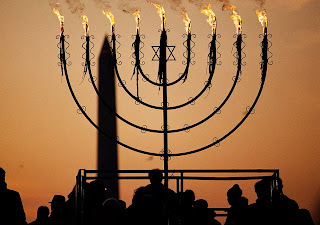 The Second Temple was then cleansed and the Menorah was lit. When they went to light the candelabra, they only had enough oil for one day, but by a miracle, the oil lasted for eight days. The Menorah holds nine candles -- eight for each night that the oil lasted, and the 9th (center) candle that represents the shamash (servant) candle. The shamash candle is used to light the others, one on each of the eight nights. Did you know that Hanukkah means "dedication" in Hebrew? This picture to the right is from my honeymoon to Italy last year, and the Arch of Titus depicting the Menorah. You can see a Menorah being carried by the Roman soldiers which was part of their stolen spoils of war of the Temple of Jerusalem. 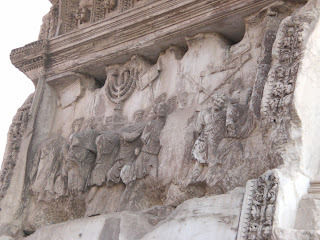 When I came across my picture tonight, I was reminded of a book I read last year that covered the Arch of Titus and this particular relief in detail. If you enjoy thrillers that include history, culture, and religion, set in stunning locales of both Italy and Jerusalem, I highly recommend Daniel Levin's The Last Ember. I had a chance to meet Daniel Levin last year at our local independent bookstore (he was also introduced by Steve Berry of the Cotton Malone series). Levin had such wonderful insight to share on the research for this book, and the room was spellbound by his stories. An Italian antiquities squad discovers a woman’s preserved corpse inside an ancient column. Pages torn from priceless manuscripts litter the floor of an abandoned warehouse. An illegal excavation burrows beneath Jerusalem’s Dome of the Rock, ground sacred to three religions. Jonathan Marcus, a young American lawyer and a former doctoral student in classics, has become a sought-after commodity among less-scrupulous antiquities dealers. But when he is summoned to Rome to examine a client’s fragment of an ancient stone map, he stumbles across a startling secret. The discovery reveals not only an ancient intelligence operation to protect an artifact hidden for 2000 years, but also a ruthless modern plot to destroy all trace of it by a mysterious radical bent on erasing all remnants of Jewish and Christian presence from the Temple Mount. Daniel Levin has created an anxious page-turning thrill ride through legends and rumors, faith and culture, and it's one that I absolutely could not put down. 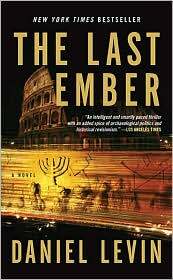 The Last Ember -- it will not disappoint. LOVE your new header!! I meant to email you earlier. It looks amazing! OMG! The Last Ember sounds like what I've been looking for, a good read. I loooove Daniel Silva's Gabriel Alon series. Levin seems to write in the same fast-paced mode. I've lived in both Jerusalem and Italy...am gonna get this book tomorrow. THANK YOU, THANK YOU! I agree with Estela. I love the header. This one sounds great, and Kittie beat me to the punch as I was planning on recommending Daniel Silva to you. This book sounds very similar. this book sounds terrific, and i like how you connected it to your trip and told the story of hanukkkah. i celebrate christmas myself, but always love a refresher in the reason behind other holidays and beliefs. BTW, Italy was my honeymoon place too!! Unforgettable, right? I didn't know anything about it, so thanks for giving us the background. What a wonderful post! Thanks for sharing this with us. I learned so much, and have to say that the new site design is gorgeous! Awesome job on all this!! This sounds really good. I'm going to have to read it. And I love the new header, too. Wow great book and I am fascinated by this history of Hannakah that I didn't know! Happy Hannakah to you! Great new look and this book sounds great! I like the sound of The Last Ember- I think it would make a good Christmas present for my mum. Happy holidays!! And thanks for the great review, this sounds like the kind of thriller I have been looking for. This sounds like a great read. I've been mulling over joining some challenges and this would fit the Suspense/Thriller challenge. Great review! Happy holidays! 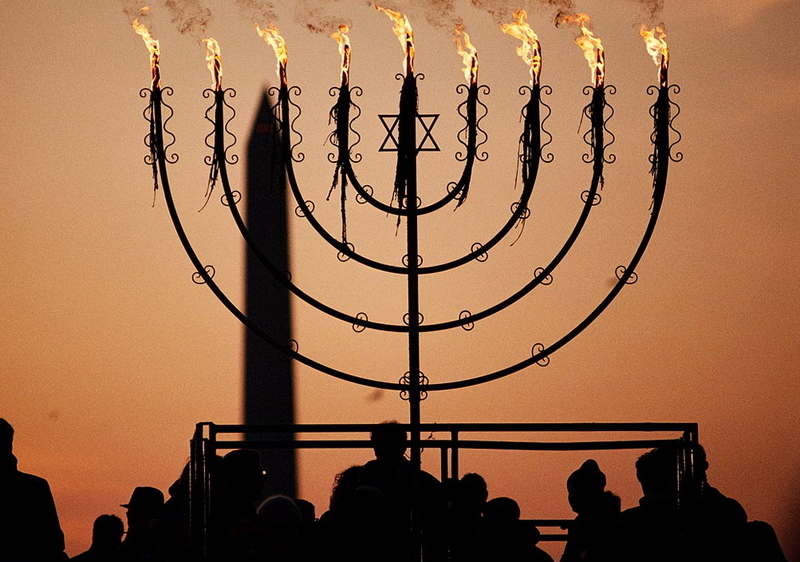 Thank you for the interesting background on Hanukkah. Sadly, I was ignorant of this information before I read your post. The Last Ember sounds like a thrill ride. So glad you all might be able to pick this book up - I really enjoyed it and found that I was flipping the pages anxiously to see what the characters were going to encounter next. Quite a bit of a thrill ride!